Hello! 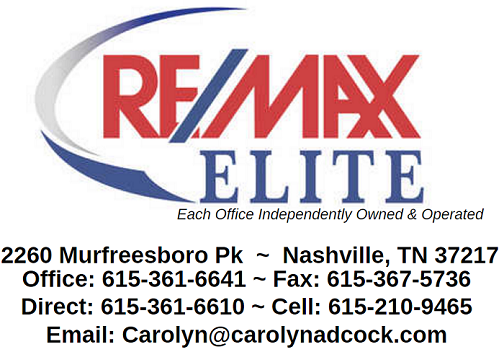 My, name is Carolyn Adcock, "The Real Estate Lady", and I am your Nashville Real Estate expert with over 39 years of experience helping people with their real estate needs…..I guess you could say that I am "The Hometown Expert With A World Of Experience"….I am a licensed Realtor and the Managing Principal Broker of RE/MAX Elite. I am a full-time Realtor with the heart of a teacher…..I want to educate my clients regarding their purchases and sales, so they will be knowledgeable and have a clear understanding of what they are spending their money on. My extensive knowledge of real estate investing, foreclosures, single family homes, and condominiums, can save you thousands of dollars when buying or selling a home and many hours of looking in the wrong areas for the wrong home! I have been investing in real estate for over 30 years myself. I believe in KNOWING THE MARKET AND AREA IN WHICH YOU MAKE YOUR PURCHASE……I KNOW HOW TO SAVE YOU MONEY AND MAKE YOU MONEY IN THE WORLD OF REAL ESTATE. I have continued to attend seminars covering topics that range from real estate investing to foreclosure and short sales resolutions. GIVE ME A CALL AND LET''S GET BUSY FINDING YOU THAT PERFECT HOME, CONDO, LAND, OR INVESTMENT PROPERTY THAT WILL BE A GOOD RETURN ON YOUR INVESTMENT.